Well...it has been a year since this trip to US but I still wanna share and recall back some enjoyable moments that I had during the trip. I did write a diary throughout the trip so I'm just gonna copy out everything from my book and add some photos....Haha!! 09.05.2006 (Tuesday): Itz 1.52am now in M'sia and also in Taiwan but itz juz 10.52am in U.S. Juz finish a meal and I'm not sure itz dinner or lunch...whatever, coz the time difference is making a huge difference. Well, I'm now on the plane to LA and we've been on board for 3 hours only. I'm not really sleepy yet(although most of the passenger are asleep already and the lights are turned-off), so I'm gonna wrap up the past few hours of our journey while listening to some chinese songs. 6.50pm: We landed at C.K.S. International Airport and went to the transit lounge and mum made some phone calls back to M'sia. I was quite surprised coz it was very quiet and there wasn't many people around. The airport was quite big with 2 terminals and both were connected by the 'Sky Train'. At 8 something, we went through the immigration and while waiting for our flight to LA at 10.50pm, I strolled around and also online via the wireless network in the airport. 10.20pm: We boarded our plane to LA (CI8) after waiting for a few hours. This flight was quite full and there were quite a lot of 'Mat Salleh'. This is gonna be an 11hours flight and we are expected to reach at 7pm in LA. It'll still be May 9 coz US is about 15hours slower than M'sia. The worst thing is that the movie system is down, that means...no movie at all for the whole journey!! OMG...so 'sui'!! Ok la..I'm gonna try to sleep now, lights were off quite some time ago. 4.00pm: I'm already using the US time now so that I will get used as soon as possible. Too bad, for the past few hours, I couldn't really sleep even though I wanted to. About 3 hours prior to our arrival, we were served breakfast(omelette). 7.50pm: Finally, we've reached LA's airport!! We had to take a bus to transfer to the arrival hall. There were lots of people waiting to go through the immigration. We've completed all the procedures at 9pm but didn't see the person who was supposed to greet us at the airport. 9.30pm: We took a van to transfer to Wyndham Anaheim Hotel and I juz slept after taking a bath...I'm so sleepy already!!! 10.05.2006 (Wednesday): I've finally found a time to write this and itz past midnight already. After a tiring day at Las Vegas, it seemed like many days have passed. Tomorrow is gonna be early again but perhaps I'll catch some sleep during the long journey. 6.20am: Departed to Las Vegas on a coach. The journey was quite long and there isn't much to do. People from different parts in Asia joined the same tour with us. All the way, our tour guide, Harry gave a brief explanation about LA. 11.45am: Our bus stopped for us to grab our lunch. Mum and dad had chinese food buffet at 'Asiamerica' while brother and I strolled around to get some fast food. We ended up buying 2 tacos and a big cheese burger for lunch at 'Jack In The Box', which I guess is quite a popular fast food chain in US. We also went into a supermarket to buy a loaf of bread before leaving. All these places were located along 'Route 66', which was considered as 'Historical Route'. 12.35pm: We continued our journey and saw a long stretch of desert along the way. This is my first time seeing a desert but it would be a bit bored as all I can see was just brown land with only tiny plants on it. At one place, we saw mirage which made the desert looked like there was a lake on it. 3.10pm: Finally, we reached Las Vegas. Itz really amazing to see such a modern city in the middle of a desert. The buildings were awesome and looks like something fake. We checked-in and rest for a while before proceeding to our night tour. 5.25pm: We took the bus to a fashion outlet first and had an hour of window shopping. 6.45pm: We went to Rio Hotel to watch the samba performance. The show was quite interesting but our main concern was to get the necklace thrown by the dancers. It was really exciting and we had fun there! 7.30pm: Next, we went to Caesar's Palace to watch a short show by the robots. The storyline didn't really attract me but the decorations around and the surrounding effects were beautiful! Caesar's Palace is a pretty big hotel and is beautiful but we just saw it from the outside only. 8.00pm: We went on to 'The Venetian' hotel after that. Inside the building, there was a miniature italy and even the sky looks real. There was a canal inside where real gondolas were moving around. 8.55pm: Next, we walked over the street to watch the volcano eruption in front of 'Mirage Hotel'. The waterfalls and the plants around it was beautiful, especially when all the lights are on. 9.10pm: Our last destination was 'Bellagio Hotel'. We saw a tropica garden with real flowers inside the hotel and took some photos. At 9.45pm, we went to the front part of the hotel and watched the musical fountain. It was really beautiful with all those lightings and beautiful buildings around it. 10.00pm: Our night tour ended and we went back to our hotel. Forgot to mention that we stayed in '4 Queens' hotel which was situated in the old town of Las Vegas. The new town is in fact the district where all the new and luxurious hotels are situated. We went for a walk along Fremont Street which is just behind our hotel and basically, there was casino almost everywhere. We bought some postcards and a t-shirt as souvenirs. I was already very tired after rushing to many places just now. Along Fremont Street, there was a huge and long canopy above and we saw some animations on the canopy. 12.30am: It was time to go back to hotel coz we were all tired already. I fell asleep very soon. Las Vegas is really a beautiful city and the night view and night life is really so exciting! Tomorrow will be Grand Canyon!! 11.05.2006 (Thursday): I'm now on our way back to LA and itz now the end of our 3 days 2 nights tour to Las Vegas and Grand Canyon. Itz 11.10pm now and Las Vegas is quite hot, 30 degree Celsius. I'll now write about our trip yesterday. 6.20am: It seems a bit early to depart but right here, it's like about 10 something in M'sia, very sunny and bright. We had some light breakfast and went on the bus for a long journey to Grand Canyon. Itz gonna be a 5 hours journey there so itz gonna be a bit tiring. 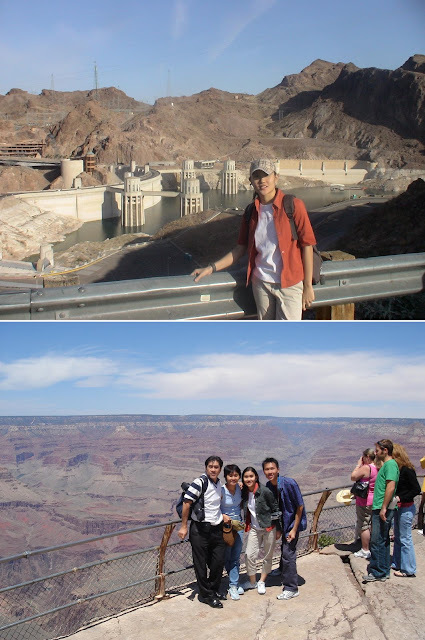 9.00am: On the way to Arizona, we passed through Hoover Dam and saw Lake Mead which was juz nearby. Lake Mead is the only place in this desert where people can have water activities. Hoover Dam is not as big as other dams because it was built in 1931 and along Hoover Dam, the surroundings is quite nice and special. Our bus had to go through inspection before we are allowed to go in due to safety reason. The road is winding and it looks dangerous because the dam is deep. We stopped and took some photos. We continued our journey after that. The journey was really boring coz all we could see was just desert and nothing else. Except when we were about to reach Grand Canyon National Park, there was a whole stretch of trees, which is quite nice and we couldn't see it back here. 1.00pm: Finally...finally!! We've reached Grand Canyon National Park! We walked for a short distance and reached the Rim of Grand Canyon. Wow!! Itz really huge and magnificent!! We are at the top and itz kinda scary to look down because itz really deep down there. All we can see is the brown mountain with different shapes. There were several spots for visitors to capture some nice photos. Actually, the trail is very long but we only stopped at 3 spots. Itz really awesome, no wonder itz one of the seven wonders. 1.45pm: We had pizza for lunch and then watched a 3-D movie at IMAX which was just beside Pizza Hut. The movie was about the history of Grand Canyon and itz quite exciting because it is 3D and we can really see Grand Canyon from the Colorado River, which is the only river flowing through it. 3.30pm: It was time to get back to Las Vegas and it was amazing coz I slept for about 4 hours throughout the entire journey! I didn't even go down the bus when we stopped at the rest house. 8.00pm: After a long nap, we reached our hotel. We quickly went back and then rushed down to take the shuttle bus to the Strip and we were so lucky to be just on time to board the bus. 9.20pm: We got down at the Mirage and walked to Treasure Island Hotel which was just around the corner. There'll be a show at 10pm and according to our tour guide, we need to reach 30 minutes earlier. There weren’t many people when we reached so we managed to get a good spot. We waited for more than half an hour! 10.00pm: The show started and once again the story is not so interesting. However, all the lightings and the pirate ship was nice. There were some dancing and acting by some muscular guys and also 'ren yao'. The show is called 'Sirens of TI'. During the show, i was amazed by the effect including the splash of water, the canonballs which caused a real hot fire and also the sinking of the pirate ship. I guess they must have spent lots of money to do all these. There were also some fireworks and it was really nice! 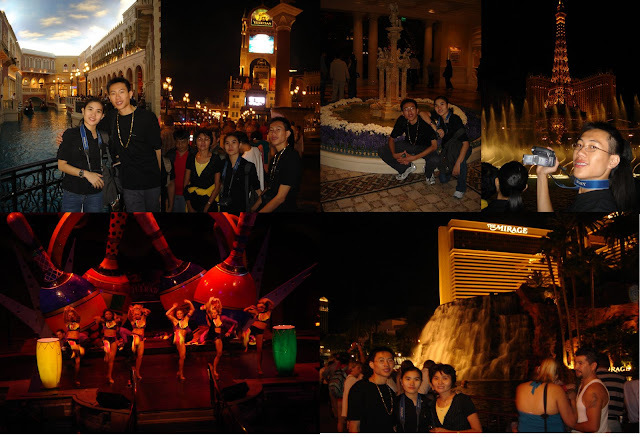 10.40pm: After the show, we took some photos there and walked along Las Vegas Boulevard where the streets are filled with hotels and beautiful night view. 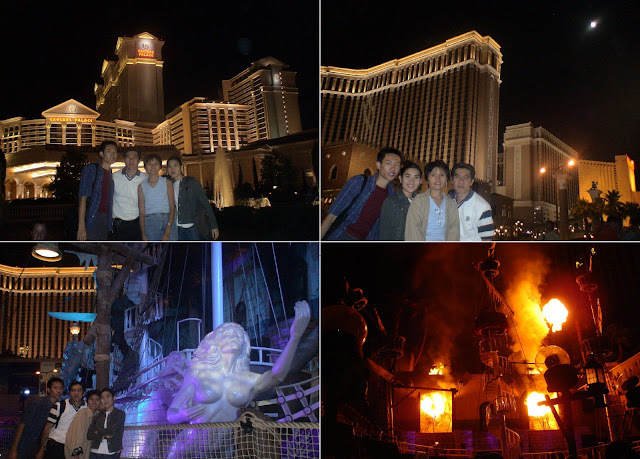 We took photos at The Mirage, Caesar's Palace, Eiffel Tower, Bellagio and so on. I am tired coz I had to wait for dad and bro to set up the camera. Luckily, I slept on the bus juz now. 12.30am: We took the bus to Luxor Hotel, which looks like a piramid to take some photos. At the top of the piramid, there was a high volt spot light which is really bright and we can see it even from a long distance away. 1.40am: We took the bus back to our hotel and at this time, we were tired and sleepy already. Before going back to our room, we went back to the same shop yesterday to buy 2 hotdogs and a cup of soft drink. We also went to McDonalds to buy some burgers and pies for tomorrow's breakfast. Today has been really tiring and it's time to get a good rest. 12 May 2006 (Friday): I’ll continue writing now because I’ve got nothing to do on the bus right now. Anything after this will be continued tonight or tomorrow. 8.50am: I slept really late last night so still feeling a bit tired this morning. We are leaving Las Vegas today so we are gonna check out now. Mum and dad went down to buy some souvenirs. 9.15am: The bus dropped us around MGM to take some photos but we didn’t really took much coz itz nicer with the lights on and we’ve been here last night. Brother took the time to go to the bus stop and managed to sell our bus ticket for $2 each (that was my idea)…Well, not bad!! 9.50am: We went on to Luxor Hotel to have a look and once again took some photos. 1o.40am: It was the end of our trip to Las Vegas and we are on the way back to LA. We’re going to travel for about 2 hours to reach our next stop, which is Barstow to grab our lunch. 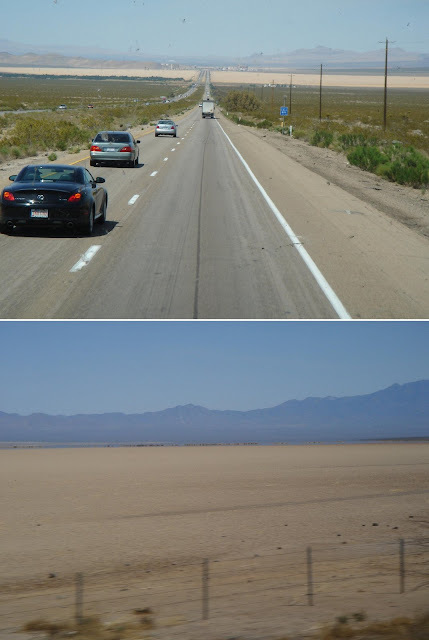 Itz really boring along the way because all I can see is desert and the weather out there is Hot!! 1.00pm: We stopped for lunch at Barstow again and we all had buffet. We also went into Levi’s shop to buy 2 jeans for bro. We left for LA at 3.2opm. 6.10pm: We reached Wyndham Hotel once again and checked-in to rest for a short while. 7.30pm: We went for a walk around our hotel and it was quite cold especially when night falls. We spent quite some time at ‘Shoe City’ but ended up buying nothing. After that, bro and I walked to a supermarket nearby to buy 2 loafs of bread. 9.15pm: We went back to our hotel to rest. We’ll be going to San Francisco tomorrow!!! 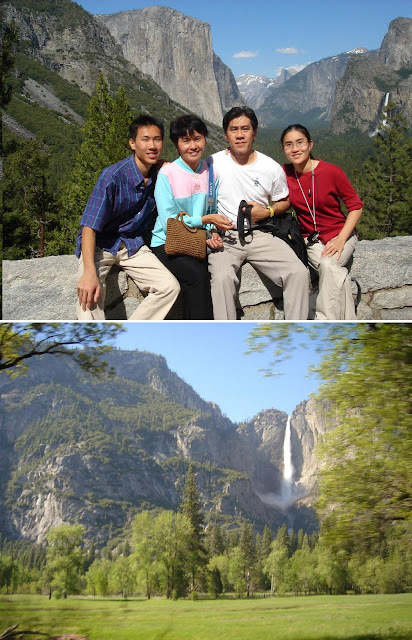 13.05.2006 (Saturday): It has been the 5th day of our trip in U.S. and everything has been great. Today is the start of our 3 days 2 nights tour to San Francisco. We’ve travelled a long journey today and most of the time, we were on the bus. 6.40am: We departed from Wyndham Hotel to San Francisco and the weather outdoor is quite cold. On the way, the bus stopped at several places to pick up other passengers. 8.00am: We started our journey and today’s tour is really full with 61 people on board. 12.10pm: The coach stopped for us to have lunch and mum and dad had Chinese food while bro and I went to a fast food booth to grab some hot dogs and burger. 1.00pm: We continued our journey and I took a short nap along the way. 4.30pm: We reached Yosemite National Park’s valley and stopped to take some photos. The scenery is really nice and all the trees are red wood. There are also 2 waterfalls around and the water is strong and white. We then went for another stop at another place and walked to the lower part of a waterfall. When we reach the bottom of the waterfall, it was freezing cold and we were all wet. The view was amazing and I liked the big splash of the water when it reached the ground. 5.40pm: We left Yosemite National Park and travelled 2 hours to go down the winding road. We continued our journey heading back to our hotel. 7.30pm: We stopped at McDonalds for dinner and then continued one and half hour journey to Oakland, San Francisco, where our hotel was located. 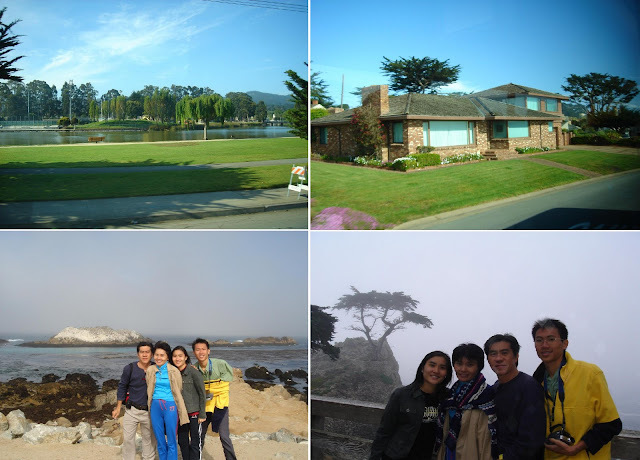 14 May 2006 (Sunday): Today’s Mother’s Day and itz our 2nd day in San Francisco. We’ll be going for the city tour today and it’ll be another long day. 8.00am: We were late and were the last to board the bus this morning. We went to San Francisco and passed by the Bay Bridge. Our 1st stop was Chinatown. 8.50am: I could see lots of Chinese there and according to the tour guide, this is the 2nd largest Chinatown in US after New York. We didn’t join the others for breakfast but instead strolled around and bought 5 t-shirts and American Ginseng. Once again, we were the last to board the bus again!! 10.00am: Next, we went to Lombard Street which is a flower street. We had to hike for quite a distance to reach the place. The road was really steep and it was kinda tiring to climb up. However, we couldn’t see much flower there. The only special thing is that the road is so winding and itz the most crooked road in the world. 11.10am: After hiking up and down, we went on to the Palace of Fine Arts to take some photos. It’s just a building and nothing much to see. 11.40am: We then proceeded to Golden Gate Bridge to take some photos. Itz the same like what I saw on books and magazine so now I am seeing the real one! 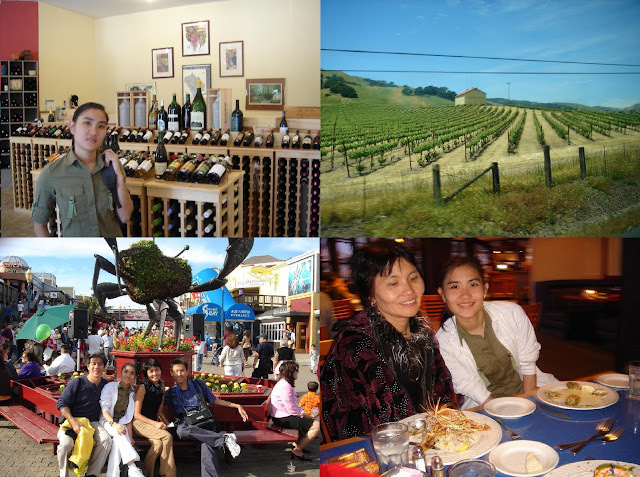 1.00pm: We travelled for about 1 hour to get to Napa Valley which is famous for its wine. The landscape around the valley was beautiful but we couldn’t see any grapes yet because this is still not the season yet. We stopped for lunch and tasted some wines. We didn’t take any lunch but bought some ice-cream and also wines. We went back to San Francisco again at 2pm. 4.00pm: We arrived at Fisherman’s Wharf and because we decided to take the cruise, we bought the tickets and got the 4.30pm cruise. 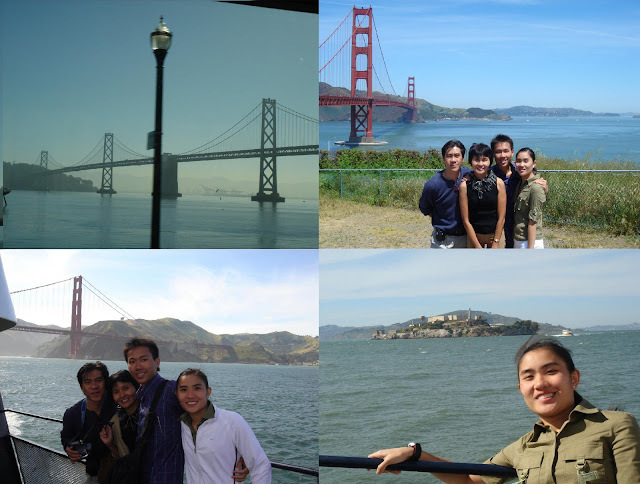 We sailed through Golden Gate Bridge, Alcatraz (an island used to be a prison). It was quite windy and cold on the cruise. It took us 1 hour for the ride before we were back at Pier 39. 5.30pm: While waiting to get back to our bus at 6pm, we walked around Pier 39 and bought a special bread called ‘Chowders’. 6.15pm: We didn’t join the others for dinner but went to a supermarket to buy another loaf of bread and also a wine. After that, we walked back to Pier 39 to look for some seafood for dinner. 7.45pm: There were too many restaurants to choose from and we ended up choosing Dante’s Crew. We had lobster, salmon, crab and some other food which I dunno the name. It was quite a rush coz we were short of time. 9.00pm: We boarded our bus and headed back to the hotel. What a tiring day! 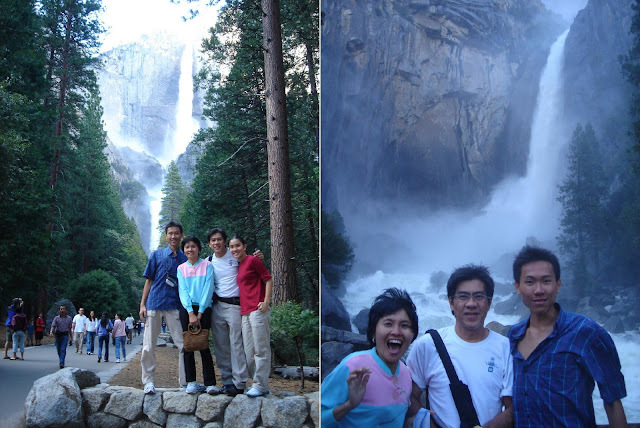 15 May 2006 (Monday): We’re now back to LA after spending most of our time in the bus for the past 6 days. We have got 3 more days to go only for this US trip and itz kinda going too fast! Tomorrow, I’ll be having lots of fun at Disneyland!!!! 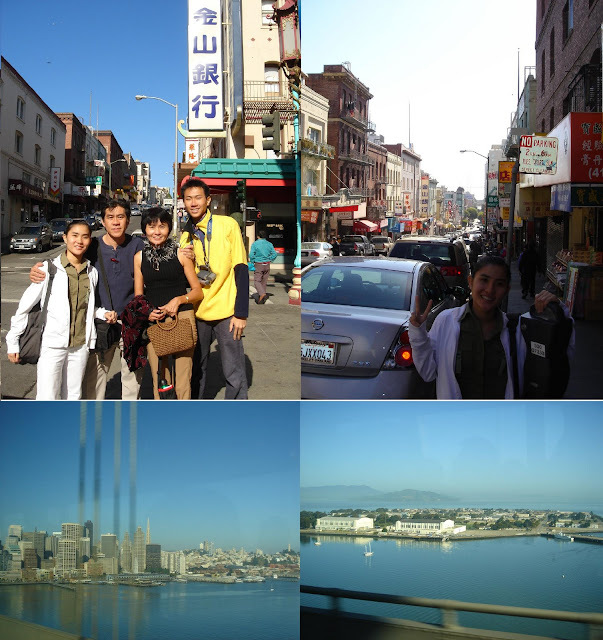 7am: We departed from our hotel and left San Francisco to take a long journey back to LA. 9.45am: We passed by Monterey Bay which was a beautiful district by the Pacific Ocean and there were quite a lot of yachts by the bay. After passing by Monterey Bay, we went on to 17 miles drive. It was a housing area which is also facing Pacific Ocean with a big golf course for the rich. It’s called 17 miles coz all the roads connecting every houses is as long as 17 miles. We stopped at 2 places to take some photos but it was so so freezing cold and windy so I got back to the bus pretty fast. There were also some mist around. 11.00am: After the 17 miles drive, we continued our journey and I managed to take a nap as there were some empty seats around. 12.40pm: We stopped for lunch and mum went for Chinese buffet again with brother while dad and I walked a distance to look for fast food and I had a sandwich with steak in it. Haha…I looked stupid coz there was a machine that dropped the change automatically but I didn’t know and didn’t get back my change until the next customer gave it to me. 1.30pm: We went back to our bus and continued our journey and I continued sleeping until the next stop. 4.00pm: After waking up, I took my time to study a little while listening to music. 7.00pm: We reached Wyndham Hotel again and after checking-in, we walked around and went to Farmer’s Market, Shoe City and Food 4 Less for some shopping. I got 2 more new sport shoes…1 Adidas and 1 Reebok…Yeah!!! 9.45pm: We went back to our hotel and had roast chicken, yoghurt, soft drinks and fruits that we bought just now for dinner. 12.47am: It’s bed time but I’m still watching Jay Leno’s show and saw Simon Cowell and Ryan Seacrest on the show. Good Nite!! Disneyland!!!! Itz a place where everyone dreams to go and I’m definitely looking forward to it!! 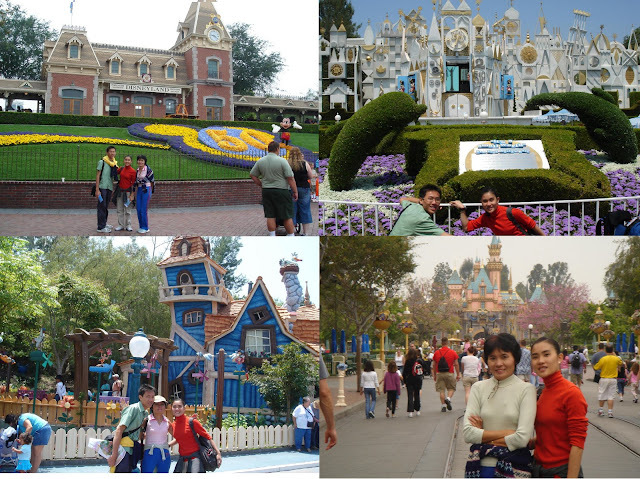 Well, Disneyland is a really large area with different themes such as Critter Island, Tomorrowland, Fantasy Land and….. We went to each of them by following the map given. One by one, we played every games except those that are too childish and from morning until it was closed at 9pm, we just kept on walking and playing without really stopping for meals. The weather was still breezy and chilling in the morning but when it was noon, it was really sunny and hot and I was wearing a long sleeve t-shirt!! I was tanned again!! But when dawn falls, it was cold again. Everything in Disneyland was really well maintained and it was very clean, even for old rides. 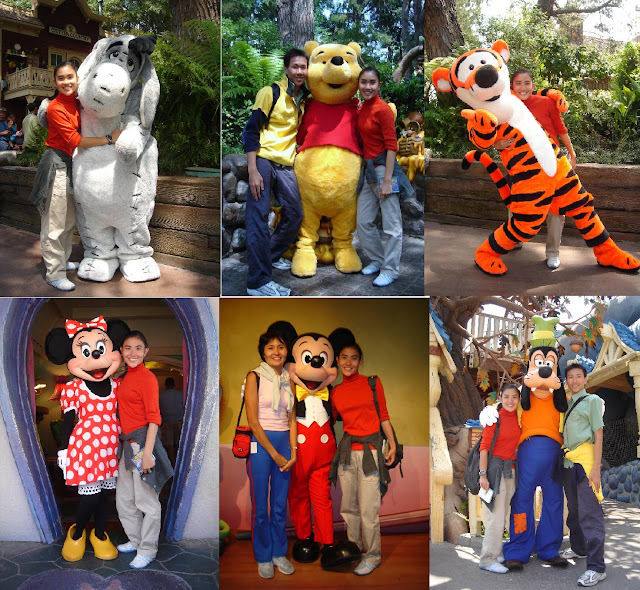 Besides that, there were a few characters that came out to meet all the visitors and I managed to take some photos and autographs from Winnie The Pooh and friends, Mickey & Minnie and some others. Haha…I was like a kid!! We had to queue for a while for every ride and luckily they were efficient enough so we need not wait too long. The people there were also very friendly and nice. I enjoyed seeing all the American kids because they’re so cute and adorable and itz fun playing with them. 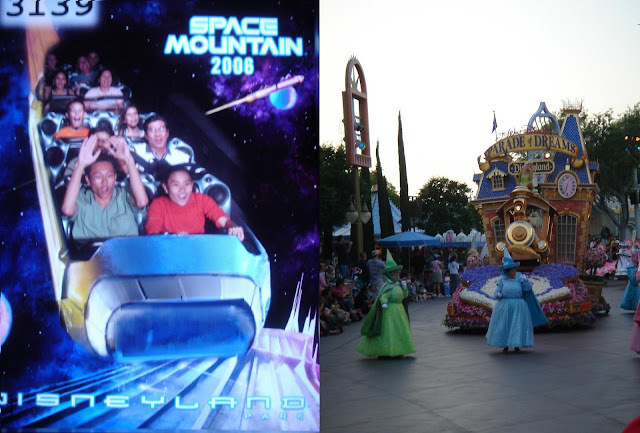 There weren’t really any thrilling rides in Disneyland but there were still one or two which is really exciting. I’ll have to wait til tomorrow’s California Adventure for more thrilling rides! In the evening, there was a parade in Disneyland with dance and music by all the Disney characters…nice!! 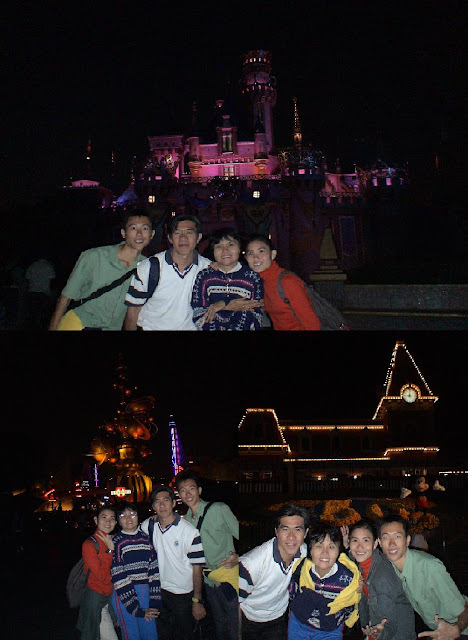 Disneyland is said to be the happiest earth on land and it's really true!! 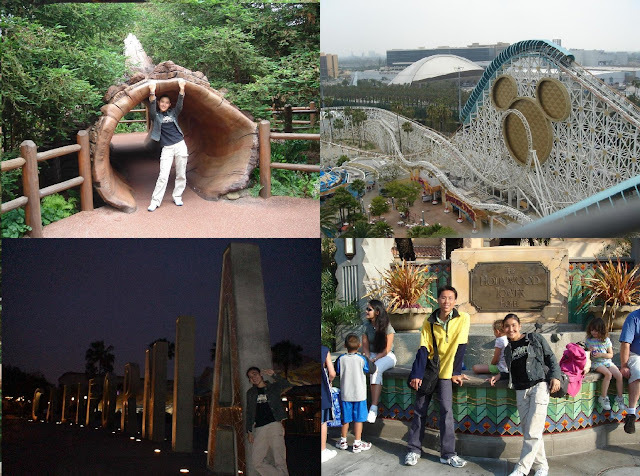 17 May 2006 (Wednesday): Today, we went back to the same place as yesterday but we’re in a different theme park. We’re in California Adventure, just opposite Disneyland. We were a bit early when we reached and the door wasn’t opened yet. Same like Disneyland, we had to use the map to walk around and our pace was slower today, I don’t know why, We spent the entire morning in just 2 places playing the same rides and watching some show which I thought was a bit too childish and took some photos and autographs of some characters. Today’s weather was a bit better than yesterday because it was not as hot. Indeed, the rides here were much more exciting and awesome. I really had fun in those rides and I felt that it was not as scary as the ones in Genting. I guess itz because the rides here after safer. We had a light lunch at McDonald’s, which was really expensive. We continued with other rides. We also watched some shows again. We played every single rides except 4 or 5 which were meant for kids and by the time we decided to say goodbye to California Adventure, it was just 7 something. We then walked to Downtown Disney to have a look at some shops and the people there and took the shuttle bus back at 8.15pm. Mum and dad walked to a Chinese restaurant nearby and bought a lot of delicious food back and we had a sumptuous dinner!! Tonight is our last night in US and we’ll be going back in a couple of hours more!! Today’s our last day in US and we still have an entire day to go. 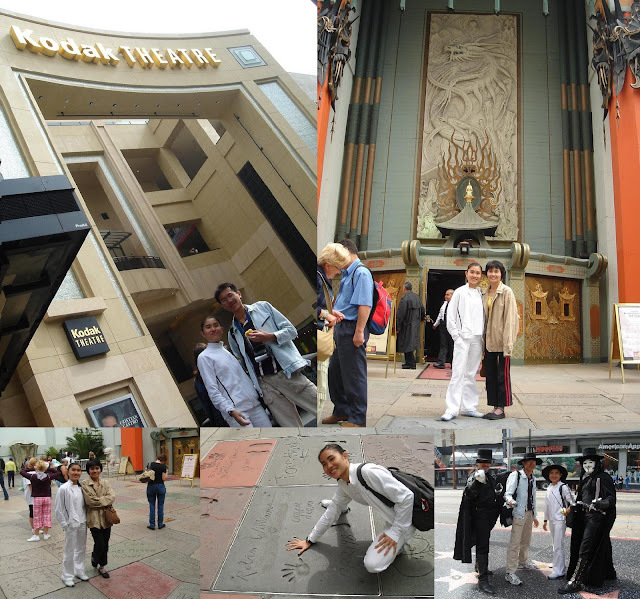 We went to Kodak Theatre and Universal Studios. 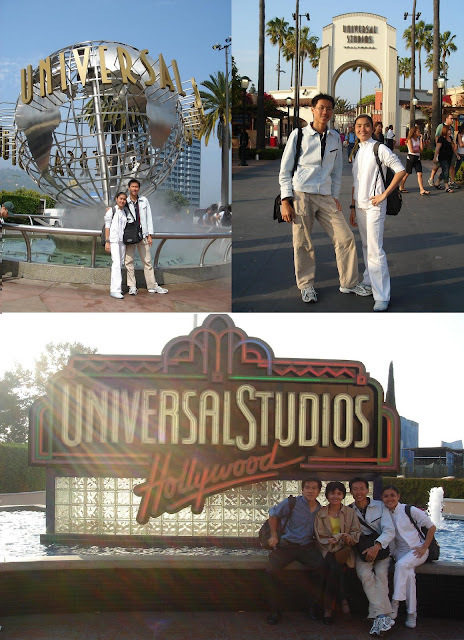 We took some photos for a short while at around Kodak Theatre then proceeded to Universal Studios. Kodak Theatre is in fact the place where Oscar, American Idol Finale and many Hollywood events are held. 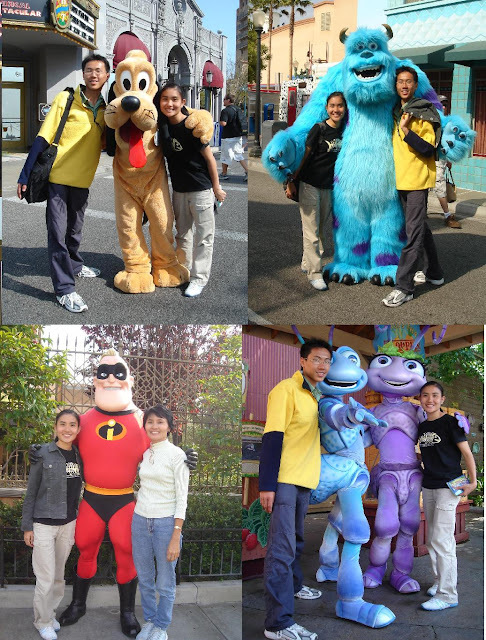 Universal Studios is not my favourite because I wasn’t really sure what to expect inside. It was sunny but windy so I wore my jacket all the time. We watched a couple of shows and had a close look of how movies were shot and also the real set used in filming. However, I didn’t really enjoy the 3D shows coz it was almost the same for all. We also went for some rides but it wasn’t as fun compared to those we had for the past few days. While waiting for our van to fetch us to the airport, we had our dinner at CityWalk. We had a delicious western dinner tonight!! We reached the airport at about 8.30pm and we still had to wait until midnight so it’s gonna be boring. Tomorrow…Should be the day after tomorrow coz time changes again. We’ll be in Taipei!! Here we come, Taipei!! Goodbye U.S!! !